Partly cloudy all day. Cold in the mornng and cool later. I slept well on a very cold night and forced myself to get up in the freezing pre-dawn gloom at 6:30am, knowing that I had a big day ahead. Because the morning's are so cold, I usually put back on pretty much all of the clothes I was wearing the night before while I go about packing up the tent and having breakfast. Then, the last thing I do before I start hiking is put on yesterday's hiking gear and pack away the extra clothing. It adds time, but makes life more bearable. While I packed up, dawn broke and the hues of Paddy's River Dam seemed to change every few minutes. It was magically still, with the occasional kookaburra call and something, maybe a fish, disturbing the lake's surface now and then to create a small circular ripple. I was told later it was a great trout fishing spot. Soon after 8:30am I began hiking through the tussocky alpine forest on a superb morning. The going on the well-defined single-track was easy, the scenery magic and I anticipated a lovely day. I did finally see three or four brumbies when we all startled each other around this time, but they quickly galloped away through the trees and over a ridge. It continued like this for the first hour and a half and I became confident that I would reach the Henry Angel Trackhead in good time to hitch a lift into Tumbarumba and have an early mark. After a short break, the track began to follow an old water sluice that had once carried water from Paddy's River Dam to Tumbarumba to generate hydroelectricity for the town. It was now just barely a path following the contours around the side of a mountain and the going became much harder. It was soft underfoot and overgrown and I frequently stumbled on hidden rocks and roots. I got "up close and personal" with hundreds of tree ferns in the many ravines the trail crossed, often having to bull-doze my way through the vegetation, thankful that it hadn't been raining. In many places large trees had fallen across the trail necessitating some careful clambering. It took the best part of three tiring hours to traverse this section and, although it was exhausting, I did take time to appreciate the lovely country and the efforts of Hume & Hovell's party in finding a route through this country. Lower down the track passed by the remnants of an old timber mill and many gold mining enterprises, mostly reclaimed by the bush. It's amazing how quickly nature reasserts itself. Eventually, the track reached a private pine plantation and then followed forestry roads and firebreaks to grazing country and more old gold mine workings. By this time my legs and feet were tired and I was very glad to see the Henry Angel Trackhead Campsite come into view. There were quite a few RVs and other car-based campers staying there. I passed through the Campsite and set myself up in a hitch-hiking position on the Tooma Road at 4:30pm in the gathering dusk. 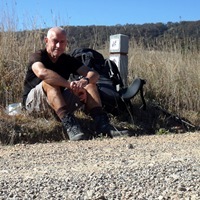 After 20 minutes not a single vehicle had passed going my way and I decided to begin walking towards Tumbarumba, 8km away, in the hope of getting a mobile phone signal and possibly calling someone in town (the motel or taxi.....but the town's probably too small). Anyway, after walking about one kilometre, two cars passed and the second, a young couple in a pickup towing a boat, stopped and picked me up. They had had an unsuccessful day's fishing on a nearby lake, but said this was unusual. The guy said that one of his casual jobs was clearing the Hume & Hovell trail of brush and treefalls with a chainsaw and that he would be back up there after the winter. They dropped me at the motel I had earlier booked in town and I decided, given the relatively late hour, the washing I needed to do, and the longish next section of trail, that I would stay two nights and have tomorrow off. I showered and walked into town to get some take-out dinner before having a quiet night in the hotel, looking forward to a sleep-in in the morning.